After a few public call-outs, two fighters finally clashed last night in Atlanta, Georgia. Dominique “SonicFox” McLean and Goichi “Go1" Kishida met in the ring at Final Round 2018 for a first-to-10 wins exhibition. The result was electric. McLean has been dominant in the western Dragon Ball FighterZ, and after a win at Winter Brawl he called out anime legend Goichi. While followers outside Japan might not be as familiar with Goichi’s exploits as they are with SonicFox, make no mistake: Goichi is a master of games like Melty Blood and other anime fighters. Dragon Ball FighterZ is as close to home turf as it gets for him. Before the match started, commentators Tasty Steve and Yipes took the mic to lay out the difference between the competitors. When I talked to McLean last month, he told me part of the rationale behind his team was having three strong individual fighters. If you can win with each fighter on your roster on any given day, you’re going to have a leg up on players who rely on team synergy over individual strength. At first blush, it might have seemed like Goichi’s team was that kind of synergistic composition. Adult Gohan excels when he can unleash his potential, expending built-up ki to gain speed and power. 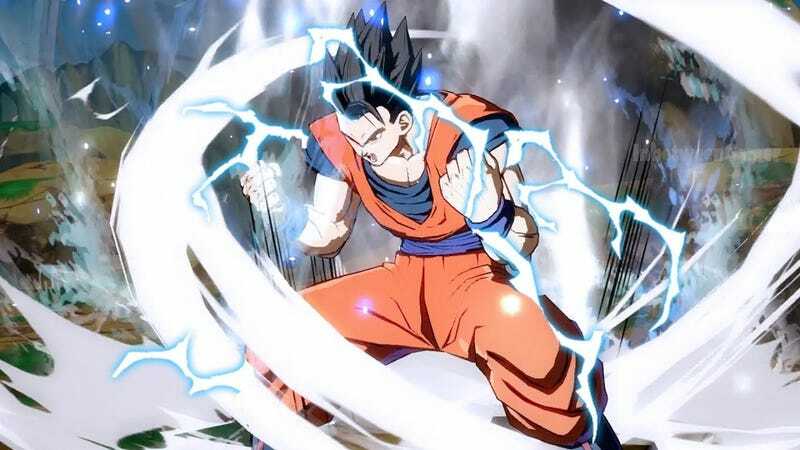 Rounding out Goichi’s team were Cell and Vegeta, two strong assist characters who could shine in their own right, but it was clear the star of the show was Gohan. After some technical malfunctions on the stream, the match got underway. McLean removed his fox ears before the start. It was symbolic, like Piccolo taking off his weighted clothing or Poongko taking off his shirt. The message was clear: this set was about to get tense, serious, and anime as hell. And to each player’s credit, the opening games were very back and forth. McLean knew Gohan was the target he needed to focus, and in early matches, made use of mechanics in the game to force Goichi to keep Gohan in play, rather than tagging him out when it got dangerous. Goichi’s Gohan was fearsome, but so was McLean’s line-up of Goku Black, Hit, and Android 16, three fighters who can easily run down health bars. The turning point came in game 7, tied at three wins apiece. The tough part about a first-to-10 set is that it’s a long time to get used to your opponent. After enough games, you start to internalize each other’s quirks and mix-ups. You’re not just playing a Gohan player anymore, you’re playing Goichi’s Gohan. When one player has fully internalized the other’s playbook and starts to go off on them, breaking down every mix-up and trick, fighting game fans will refer to that as “downloading” someone. You know their program. And in game 7, one exchange made it clear that Goichi had figured out SonicFox’s playbook. The read on McLean’s parry was brutal, a crushing blow that would make any player uneasy. Your tricks are suddenly not tricking the opponent anymore. More than that, it was becoming clear Goichi’s team was not solely reliant on Gohan. His Cell and Vegeta are also impressive, and Goichi was crafting some impressive combos on the two. It was still Gohan that shone in the set, though. Part of Gohan’s appeal is the potential unleashed move, unlocking more power and speed with every use. The character also packs a tricky set of moves designed to fool your opponent into blocking in the wrong direction or stance, and his ability to instantly drop to the ground from the air means he’s able to extend pressure the way others can’t. The Gohan offense would go off on McLean, leaving him in a constant state of defense hoping for an opening that wasn’t happening. The tally kept climbing in Goichi’s favor, and in game 14, he delivered the last major blow. McLean is well-known for his Hit, a character that can strike from a distance and put opponents on the back foot trying to calculate his next move. A read and counter of an incoming overhead let Goichi open McLean’s hit up, taking a full health character down to zero in one go. Goichi took the exhibition at 10-4, a result that shocked many who thought McLean was a sure bet to win. But the anime legend could not be stopped. Now, there’s a new story to tell. McLean, humbled by an exhibition, looks to still make a mark in the Dragon Ball FighterZ tournament at Final Round, starting today. Goichi will also be playing, now the assured top player in the pool. The soonest these two could meet for a rematch this weekend would be in the winner’s finals. Will we see a runback? Or will Goichi cement his seat on the throne? Whichever way it goes, Dragon Ball FighterZ is already delivering a narrative and then some.